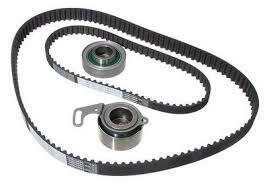 One of the most overlooked maintenance procedures is timing belt replacement. One strip of rubber keeps the top end of the engine moving in perfect time with the bottom end. What happens when that belt wears out and breaks? You don’t want to find out. See the maintenance experts at Precision Automotive Service before your timing belt’s life is over. Do you know when your timing belt is due for replacement? Our technicians do. We follow your vehicle manufacturer’s maintenance guidelines to know when best to replace your timing belt to prevent catastrophic engine failure. Our ASE-Certified technicians are fully trained and capable to replace your timing belt or timing chain, no matter the make or model. Trust the professional service at Precision Automotive Service to take care of your timing belt maintenance replacement. If any additional repairs are required, you will be provided with a comprehensive and detailed quote. Put your timing belt replacement in the hands of the top-rated Sacramento repair shop, Precision Automotive Service. Book an appointment online or call us today to schedule a visit.